The graphic novel collaboration and true story of two sisters. Ana le, a writer, leaves for Palestine volunteering in an aid program, swinging between her Palestinian friends and her Israeli friends. Delphine is an artist, left behind in Li ge, Belgium. From their different sides of the world, they exchange letters. 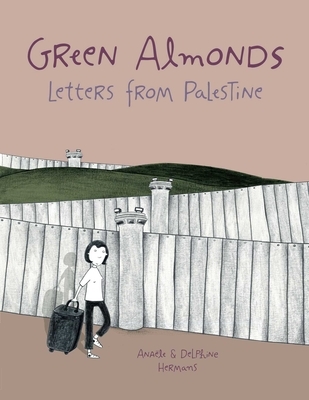 Green Almonds: Letters from Palestine is a personal look into a complex reality, through the prism of the experience of a young woman writing letters to her sister about her feelings and adventures in the occupied territories. Green Almonds is an intimate story with big implications. A young woman discovers a country, works there, makes friends, lives a love story, and is confronted with the plight of the Palestinians, the violence on a daily basis that we see on our screens and read in our newspapers. Ana le's story is brought to life by Delphine's simple and evocative drawings, which give full force to the subject and evoke the complexity of this conflict, creating a journey to the everyday life of Palestinians.Green Almonds: Letters from Palestine received the Doctors Without Borders Award for best travel diary highlighting the living conditions of populations in precarious situations when it was published in France in 2011.